Isn’t it wonderful that brother (or sister) So-and-so is in heaven? They must be playing golf every day with all their old friends! How many times have you heard (or been involved in!) a conversation like that? Do we realize what an outright lie that is? Do we really know what heaven is and what it is all about? Heaven is a place that everyone talks about and everyone hopes to go to… provided they don’t have to actually DO something to get there! The reality of heaven is that it is a prepared place for a prepared people. Unless we “store up treasures there,” unless we obey our Lord and God, then we will never live there. Let’s take a look at heaven as God presents it and see how that compares with the nonsense that people often imagine is heaven. Heaven is NOT golf, hunting, fishing nor is it about visiting with friends and loved ones! That is NOT to imply we won’t know or care about friends and loved ones: In the Old Testament, when a person died, biblical writers said he was “gathered to his people” (cf. Genesis 25:8; 35:29; 49:29; Numbers 20:24; Judges 2:10). In 2 Samuel 12, when David’s infant child died, David confidently said, “I shall go to him, but he shall not return to me” (v. 23). David expected to see his child again – not just a nameless, faceless soul without an identity, but that very child. Moses and Elijah appeared with Christ on the Mount of Transfiguration. Even though it had been centuries since they’d walked this earth, they still maintained a clear identity (Matthew 17:3) – Peter, James, and John evidently recognized them (v. 4), which implies that we will somehow be able to recognize people we’ve never even seen before. We will be able to have fellowship with Enoch, Noah, Abraham, Jacob, Samuel, Moses, Joshua, Esther, Elijah, Elisha, Isaiah, Daniel, Ezekiel, David, Peter, Barnabas, Paul, or any of the faithful. For that to be possible, we must all retain our individual identities, not turn into some sort of generic beings. 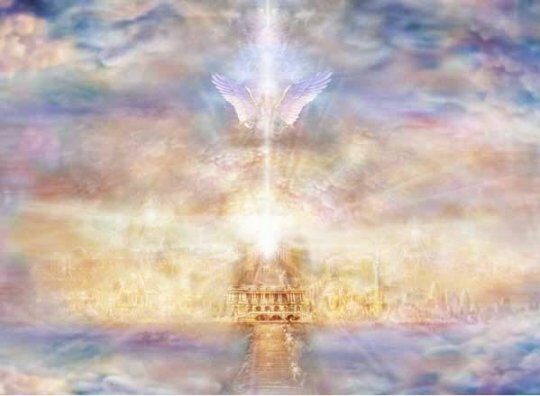 Describing the Lord’s appearing and the resurrection of the saints who have died: 1 Thessalonians 4:17 says, “Then we who are alive and remain shall be caught up together with them in the clouds to meet the Lord in the air. and thus we shall always be with the Lord’. Paul’s purpose was to comfort some of the Thessalonians who thought their dying loved ones would miss the return of Christ. He says in verse 18, “Comfort one another with these words.” The comfort comes from the prospect of reunion. Little comfort this would be if in the reunion we could not even recognize one another. Paul’s promise that we will all be “together” forever implies that we shall renew fellowship with all whom we have known. We will be reunited not only with our own families and loved ones, but also with the people of God from all ages. In heaven, we will all be one loving family. The immense size of the family will not matter in the infinite perfection of heaven. Our eternity will be spent in just that kind of rich, unending fellowship. If you’re worried about feeling out of place in heaven, don’t. Heaven will seem more like home than the dearest spot on earth to you. It is uniquely designed by a tender, loving Savior to be the place where we will live together for all eternity and enjoy Him forever. Heaven IS all about our God and our Savior! Back to that first point above. While heaven includes God’s family and all the joy that is a result of that blessing, the real purpose of heaven is NOT family, friends and loved ones. The real joy and purpose of heaven is being with our God and Savior! Every vision of heaven that John or any other prophet had of heaven is ALWAYS centered around God. If God is not your priority here on earth, if He is not your first and greatest love, then you won’t have to worry about not enjoying heaven. You won’t be there! Yes, that is shocking to many human beings, but the least of heaven’s blessings are about us. The priority of heaven, like our lives here on earth, is the focus on God. Don’t imagine heaven as the place where God will wait on you and give you your heart’s desire. Make God your heart’s desire, serve Him and learn the real blessings that God has in store for His family.